As most of you know I have a major snacking habit. The thought of eating only three meals a day puts me into a panic. I need my snacks and bake almost everyday. However, I am also realistic about my snacking and try to make sure that I have a balance between healthy and indulgent. If I make a batch of brownies one day the rest of the snacks that I prepare for the week are nuts and healthy granola bars. I believe food and health in general is all about balance. I have a tread mill that I use for an hour each day. This hour of exercise makes it possible for me to sit and watch my favorite TV shows in the evening and enjoy the time just sitting and relaxing. Cookies are one of my favorite snacks. I could literally eat cookies for every meal, they are delicious. Since I love cookies so much I try to make cookies occasionally that are lower in fat and calories. Yesterday I tried a new recipe for Lemon Thins from the February 2013 issue of Eating Well magazine. This recipe has 11 ingredients. It takes 45 minutes of total time, 30 minutes of which is active and makes 2 1/2 dozen cookies. I made a few changes to the recipe. First since I eat gluten free I used gluten free all-purpose flour instead of wheat flour. I also found that you need to make sure that the cookies are completely flat. If you don't roll out the cookies very thin they will not taste good. I actually used the side of the cup to roll the cookies after rolling the cup in granulated sugar. This method worked very well and I would recommend it. Additionally I allowed my cookies to bake for the full ten minutes to fully brown. I followed the remainder of the recipe as written. With only 60 calories and 2 grams of fat this cookie is a snack that is healthier than many other cookie recipes. Plus they were a nice snack with a cup of coffee as a morning pick-me-up. The taste was not overly lemony, which was nice. I would say that they were a little dry. To me they tasted like they needed more fat. This could be partly due to the fact that I made them gluten free. Either way I would suggest increasing the amount of butter or using all butter instead of canola oil, which would be higher in saturated fat, but would vastly improve the texture and taste. The batter definitely needs more liquid, either with lemon juice or an increase in butter. For the recipe go to Lemon Thins. MM I love lemon flavoring!!! Remember the ones from grandmas house. They were hard small lemon cookies covered with powdered sugar!! 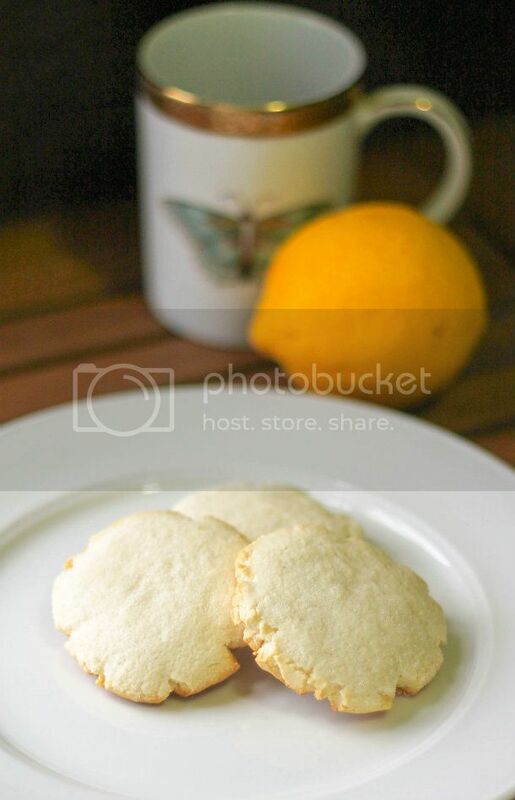 I love old fashioned lemon cookies with lots of powdered sugar also, yum! I don't know how you do it, you always have something fresh and homemade brewing in your kitchen, your an awesome mom and wife... one day I aspire to be like you in that area... I really don't cook from scratch as much as I should... heck I really don't cook as much as I should, Lol. Thanks for the sweet comments, I try, some week I do better than others :) This weekend I we have been eating leftovers since I have been tired from the long week! I definitely have to have my snacks. My blood sugar has a tendency to get too low so I have to make sure to eat pretty frequently :) Followed you back! Hi! I'm a new follower stopping by from the aloha blog hop :) I look forward to searching through your recipes! Thanks :) Come back again soon! How yummy!! I think I need to make these very soon! If you end up trying them, tell me how they turn out! I have a cup of tea and a snack every afternoon also :) It is a great way to relax and ground myself! These cookies would be great with tea, I agree. I am going to have to try this recipe out. My husband who is quitting tobacco, thank goodness, has acquired a snacking habit. This habit usually starts after dinner, once we sit down to watch our evening TV programming. Since he is regular at the gym, and doesn't want the additional calories I am sure he would be happy snacking on something like this. My husband started snacking when he quit smoking also :) Good luck with your husband quitting tobacco! Thanks for the sweet comments :) I think a recipe section on your blog is a great idea!